So, to that end Toni and I have decided to set a "Big Boot Challenge" to all the lovely plus retailers out there, surely somebody can accommodate my sizeable calves? It was with baited breath I waited for these to arrive, I just expected for them to arrive, me try them on, and not be able to zip them up like usual.... But low and behold, these fit, not only did they fit, I could wear jeans with them too! Flippedy doo! 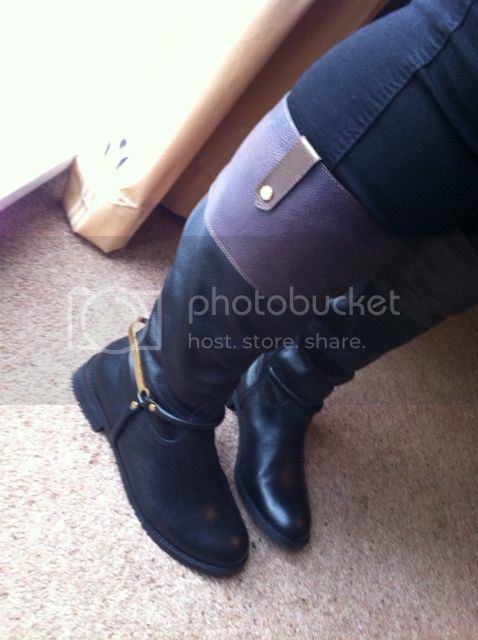 I went for the E fitting as I don't have a particularly wide foot in the riding boot style. There was bags of room in it and I found them really comfortable. I walked around all day in them, in and out of my dads car for house viewings and travelled a long while in the car. They didn't pinch or rub, I didn't have to pull them up once or adjust. My only quibble is that the brown section is a much more vivid colour on the website, I didn't find them to be in person though, but overall I liked the appearance and thought they looked good on. 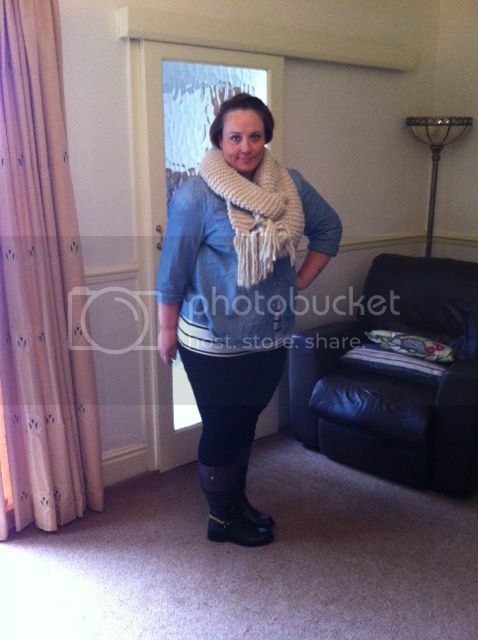 I wore mine with black jeans, stripe t-shirt, denim shirt and BIG woolly scarf for a cosy autumnal look. Thank you Simply Be for rising to the challenge! You passed with flying colours! 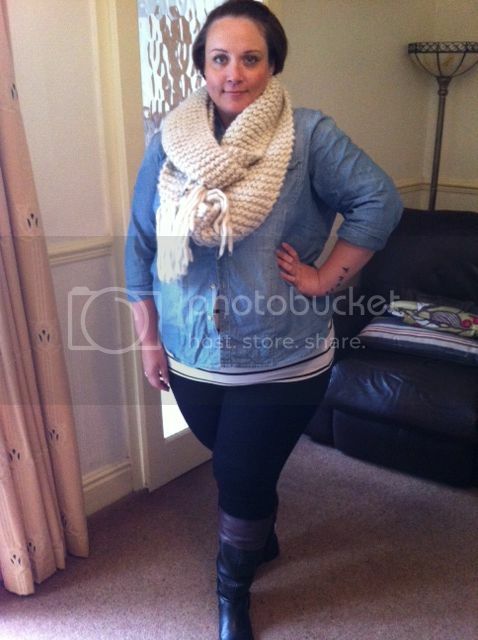 Hoorah for the Super Curvy boot! 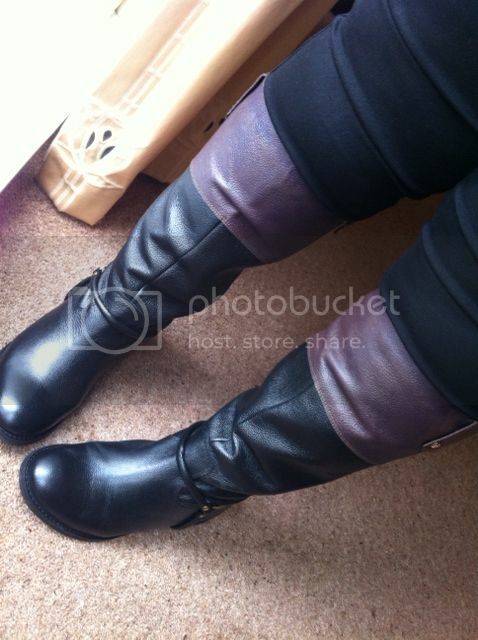 Pop on over to Toni to see how she got on with the boots! Gorgeous! 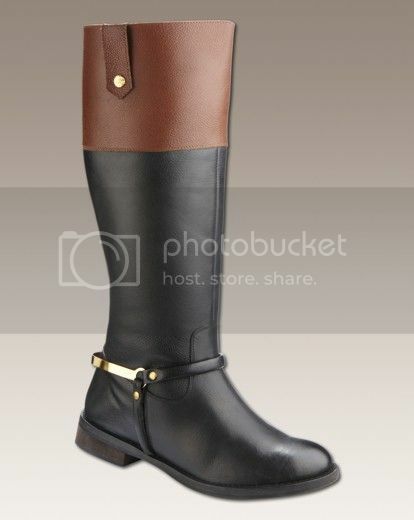 I am dreaming of adding a pair of leather riding boots to my shoe collection. Also, I love the scarf. Very cozy! Oh love this look! I like the name too, Super Curvy much nicer. I thought I could only dream of me with jeans INSIDE boots. I'm just about to skip over & grab myself a new autumn look. I struggle so much with boots, if they fit they are wayyyyy tooo expensive or, it they are affordable they don't fit. Sadly these are way out of my price range but i do love them. Those boots are soo wonderful!! Their look georgeus. im 21inches would these fit me? Could you tell me what measurement your actual calf is though? Mine are 465mm? Those boots are giving nice look to the women.